Swimming is a non-impact, non-weight-bearing cardiovascular exercise. This makes it particularly valuable to people who are obese or have range of motion issues. Whenever you are swimming, you have a lot of natural resistance from the water. Contrary to popular belief, this ensures that you are burning a lot of calories, making it a good form exercise to help lose weight. Swim for time. Swimming can be performed just like any other cardiovascular exercise. One of the ways it can help with weight loss is by swimming for a set amount of time. Perform some dynamic stretches where you move your arms and legs through a range of motion several times, hop in a lap pool and swim for 45 to 60 minutes at a moderate pace. Use the same stroke all the way through or change it up to avoid monotony. Some examples of dynamic stretches are arm swings, spinal rotations, side steps, lunges and deep-knee bends. Do some intervals. 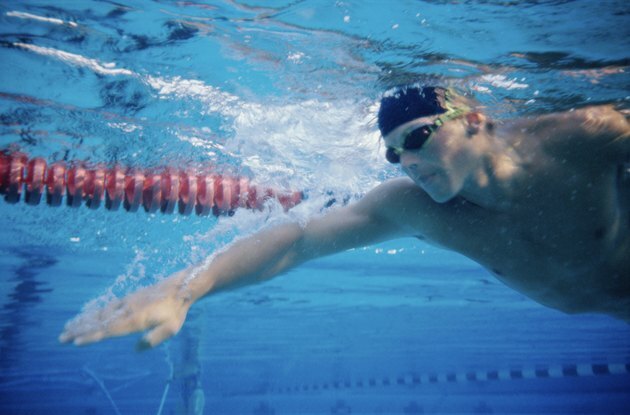 Intervals are a good way to keep your metabolism up after you have finished swimming. To perform them, swim about five laps at a low intensity, then on your sixth lap, swim as hard as you can. Alternate laps of high and low intensity 10 to 12 times, finishing with five low-intensity laps. Use swimming in a circuit. This is similar to triathlon training but you are going to do one more exercise. Start off with a 10-minute run, then go for a 20-minute bike ride, do 10 sets of 100 with a jump rope separated with 30-second rest periods, then jump in the pool and do 10 fast-paced laps separated by 30-second rest periods. Incorporate some water aerobics into your routine. In order to do this, you are going to need a pool that has a shallow end. Start out by swimming for 10 minutes. Come to the shallow end and run back and forth from one side to the other five times total. Take a 60-second rest, then repeat the swimming and running for 45 to 60 minutes. Swim regularly. In order for any weight loss program to work, you must be consistent. Swimming once a week isn't going to get it done. Instead, swim a minimum of three times a week and mix up your routines by doing long swims, intervals and circuits. When you are swimming for time, you can also swim for a certain number of laps instead. Consult your doctor before attempting a swimming workout, especially if you aren't experienced with exercise.